The Aeon (Judgment in the Rider-Waite tradition) corresponds to the Hebrew letter Shin, which represents fire burning from a coal. This is appropriate, as the Aeon also corresponds to the element of Fire. Specifically, the fire of Shin is the fire that springs from a coal, representing cleansing flame that comes from within. The letter Shin also means “change,” specifically of a cyclical nature – such as the passing of the seasons within the Year. It represents natural changes towards the future, and the constant motion of the world. It represents also the passage of time, and the progression through various Aeons, as is appropriate to the card representing the Aeon. In the Rider-Waite tradition, this card is Judgement, referring to the time of judgement during the apocalypse – a time when the world will end with Fire (corresponding to the card’s element), and the angels will call forth all the souls in the world to be judged. 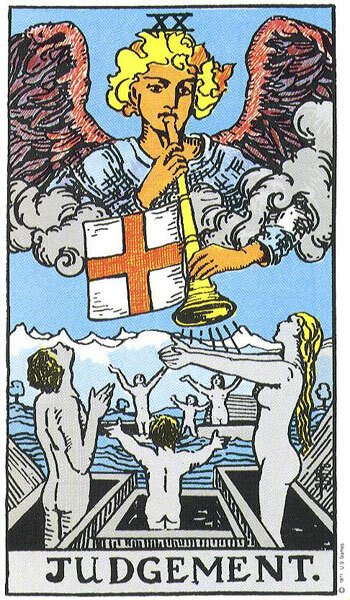 The Rider-Waite art illustrates the scene after the world has ended, with an angel blowing a trumpet to call the souls of the world to rise from the water and prepare to be judged. The Thoth card interprets the idea of a Judgement more broadly, and instead of defining it as the last Judgement, shifts the meaning slightly to incorporate all vast periods of worldwide transition – such as the passage of the Aeons. As Aeons usually change with bloodshed and chaos, Fire seems to be an appropriate sign for this card. 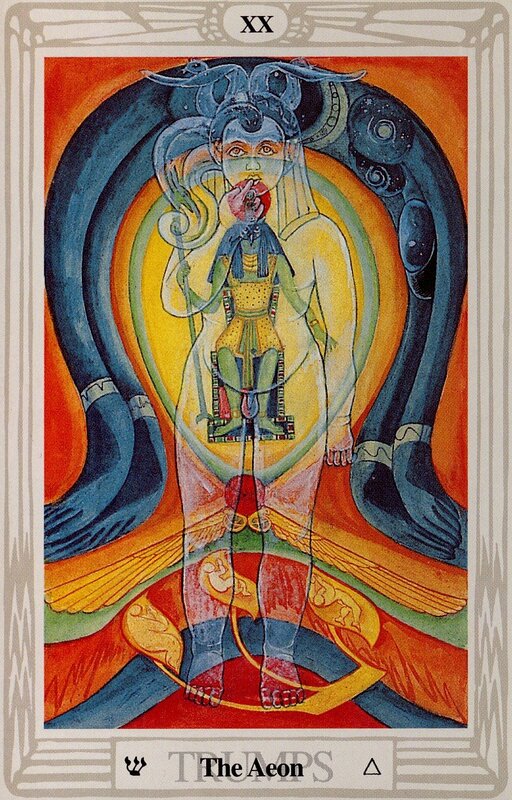 The Judgement depicted in the Rider-Waite art is the final passage of the Aeons, while the Thoth card represents all such Judgements and changes that occur. The card of the Aeon, them, represents vast change affecting the whole world, and transitions from one state into another. The card Death (XIII) also is associated with transitions, but Death refers to more personal transformations, while the Aeon indicates transitions in the world around you. It represents judgement, change, transition, and transformation. In its guise as Judgement, it also represents rebirth and absolution, washing away the old in order that the new can rise. As one’s sins are stripped away, one can suddenly gain insight into the world and the passage of time, and experience epiphanies and revelation. On the Tree of Life, the Aeon stands between Hod (Knowledge) and Malkuth (Reality), representing most the idea of revelation and insight of Malkuth into the workings of the world, into the Knowledge of Hod. It represents the logical structure of the world coming into play in reality. In a reading, this card asks you to examine the role of cycles, rebirth, and change in your world. Is the world around you undergoing drastic changes? Do you have a chance to start anew, without the past coming back to haunt you? Have you recently experienced an epiphany? Reversed, this card’s energies are twisted or blocked somehow; perhaps the world really isn’t changing that drastically, or perhaps your insights are not what they could be. This entry was posted on July 5, 2011 by Z. M. Wilmot. It was filed under Tarot .